The true identity of an unusual source in the Milky Way galaxy has been revealed. This object contains a very quiet black hole, a few times the Sun's mass, about 7,200 light years from Earth. 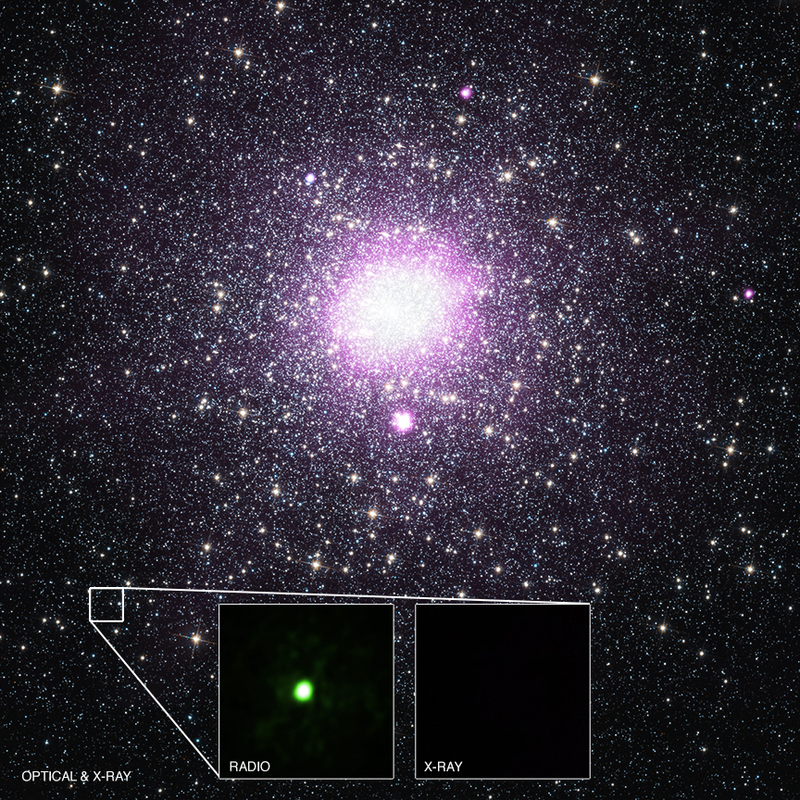 This discovery implies that there could be many more black holes in the galaxy than previously accounted for. 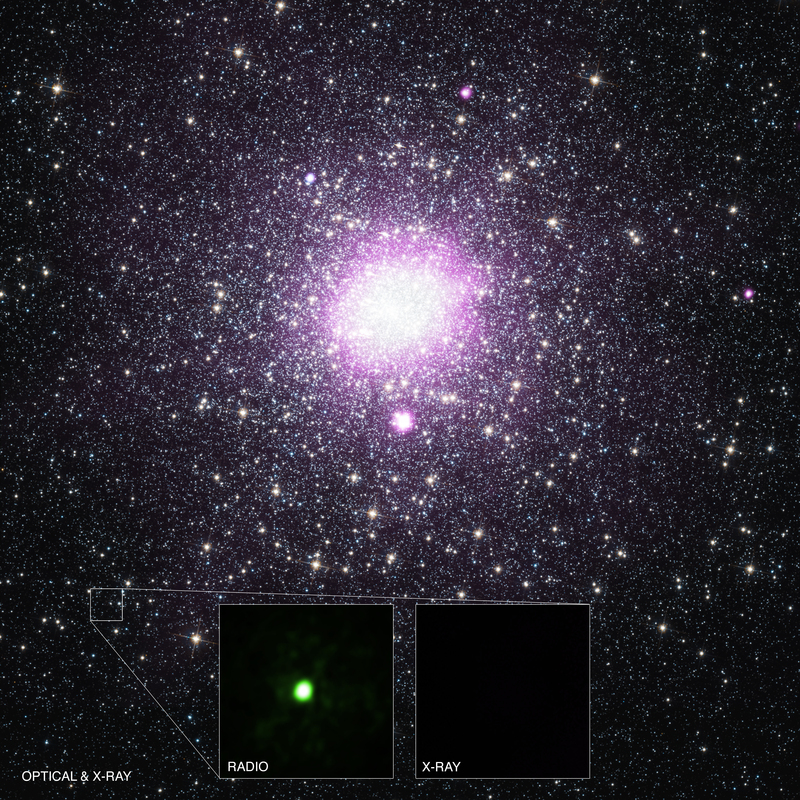 Chandra data show the source can only be giving off a very small amount of X-rays, an important clue to its true nature. The result was made by combining data from many different telescopes that detect various forms of light, each providing key pieces of information. These telescopes included NASA's Chandra X-ray Observatory, the Hubble Space Telescope, NSF's Karl G. Jansky Very Large Array (VLA), Green Bank Telescope, Arecibo Observatory, and the European Very Long Baseline Interferometry Network. The collaborative nature of this study is depicted in this multi-panel graphic. The large panel shows a composite Chandra and optical image of the globular cluster M15 located in our galaxy, where the X-ray data are purple and the optical data are red, green and blue. The source being studied here is bright in radio waves, as shown in the close-up VLA image, but the Chandra data reveal it can only be giving off a very small amount of X-rays. This new study indicates this source, called VLA J213002.08+120904 (VLA J2130+12 for short), contains a black hole a few times the mass of our Sun that is very slowly pulling in material from a companion star. At this paltry feeding rate, VLA J2130+12 was not previously flagged as a black hole since it lacks some of the telltale signs that black holes in binary systems typically display. Previously, most astronomers thought that VLA J2130+12 was probably a distant galaxy. Precise measurements from the radio telescopes showed that this source was actually well within our Galaxy and about five times closer to us than M15. Hubble data identified the companion star in VLA J2130+12 having only about one-tenth to one-fifth the mass of the Sun. The observed radio brightness and the limit on the X-ray brightness from Chandra allowed the researchers to rule out other possible interpretations, such as an ultra-cool dwarf star, a neutron star, or a white dwarf pulling material away from a companion star. A paper describing these results appeared in the Astrophysical Journal. The authors were Bailey Tetarenko (University of Alberta), Arash Bahramian (Alberta), Robin Aranson (Alberta), James Miller-Jones (International Center for Radio Astronomy Research), Serena Repetto (Technion), Craig Heinke (Alberta), Tom Maccarone (Texas Tech University), Laura Chomiuk (Michigan State Univsersity), Gregory Sivakoff (Alberta), Jay Strader (Michigan State), Franz Kirsten (ICRAR), and Wouter Vlemmings (Chalmers University of Technology). Coordinates (J2000) RA 21h 29m 58s | Dec +12° 10´ 00.02"
Observation Time 63 hours 25 min (2 days 15 hours 25 min). Unless we were incredibly lucky to find one source like this in a small patch of the sky, there must be many more of these black hole binaries in our Galaxy than we used to think. The position that we quote is for the center of the image (not the position of the radio source). We did, however, double check the position of the image's center and found that there was a typo in the position, which has since been fixed. Thank you! X-rays from the Chandra, optical data from Hubble and radio data from NSF's Karl G. Jansky Very Large Array (VLA). About 5.4 light years across. X-rays are purple, optical red, green and blue and radio green.